There’s a lot people don’t know about Freedom Oliver. They know she works at the local bar. They know she likes a drink or two. What they don’t know is that Freedom is not her real name. That she has spent the last eighteen years of her life living under Witness Protection, after being arrested for her husband’s murder. They don’t know that she put her two children up for adoption, a decision that haunts her every day. Then Freedom’s daughter goes missing, and everything changes. Determined to find her, Freedom slips her handlers and heads to Kentucky where her kids were raised. No longer protected by the government, she is tracked by her husbands sadistic family, who are thirsty for revenge. But as she gets closer to the truth, Freedom faves and even more dangerous threat. I do love a good thriller. My thriller of choice usually consists of John Grisham or Harlen Coben. I do like to be recommended a good book and these days they need to be page turners that require minimal effort. 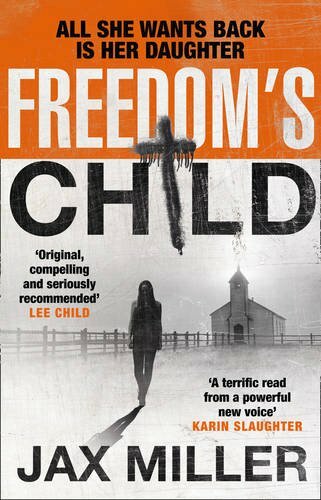 Freedom’s Child is very impressive, especially considering Jax didn’t intend this book to have an audience. They do say ‘we all have one book in us’ or is that ‘we all have one good book in us‘. I would like to think it’s the latter. Lets hope she has some more in her. I wouldn’t want to let you in on the plot and ruin this book for you. The only question I feel I need to ask is whether the book is worth reading? I would answer yes, though it is rather gritty. It took me just couple of weeks to read, speeding up towards the end! The book is full of twists and ups and downs and is a definite page turner. So give it a go. Hello I’m Sarah. Wife to Leo and Mum to our two little darlings M and Z. This is where I blog about all things creative, our outdoors adventures and travels and our homeschool life. Thanks for stopping by.